According to LibraryThing, How Green Was My Valley entered my TBR pile on December 1st, 2006. And there it sat until, in one of my bursts of TBR pile guilt, I decided to knock it off my list via audiobook. The book is about Huw Morgan, who grows up in a rural mining community in Wales. The story is told from the POV of Huw many years later, as he looks back on all the hardships and drama that impacted the people around him, and his fruitless love for his beautiful sister-in-law. The story is about a coal mining family in the early 20th century, so obviously it's not a super-happy story. There are strikes and hard times, lusting after other people's spouses, people leaving for better opportunities, and crazy gossip that people take crazy seriously. The book felt like a well-written soap opera about the working class. Llewelyn really fits the Welsh stereotype of being wonderfully musical. His sentences are like songs, with a rhythm and dance all their own. I am glad I have this book on my shelves so that I can read it with my eyes one day, not just with my ears. 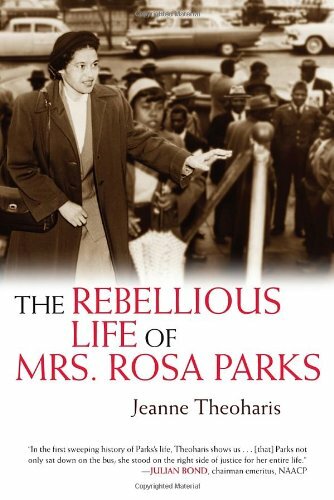 The Rebellious Life of Mrs. Rosa Parks, by Jeanne Theoharis, is one I've had on my Kindle for some months now. Rosa Parks is a personal hero as well as a national one. For those who may not know the American Civil Rights movement well, Rosa Parks was the woman "who started it all" by refusing to get up from her seat on a segregated bus in Montgomery, Alabama. She was used as a symbol to rally around, the impetus for the Montgomery bus boycott that ended in de-segregating the buses, and Martin Luther King, Jr. shot to fame and the Civil Rights movement was underway. I admit this book became a bit repetitive and dry in the later chapters. Rosa Parks struggled a lot, both in Montgomery and Detroit, and the author spent a lot of time discussing how soul-killing the Civil Rights movement could be, when people thought no change would come in their lifetimes. But Parks truly was such an inspiring and wonderful person, well deserving of a detailed biography, and I'm so glad to have learned more about her. JK Rowling/Robert Galbraith's second book in the Cormoran Strike mystery series is called The Silkworm. This time, Cormoran and Strike are on the case of a missing B-list author whose last unpublished manuscript excoriated many people in the book business. Between The Cuckoo's Calling and The Silkworm, Rowling has a lot of commentary on the upper echelons of British cultural society. Most of it isn't very positive, so I wonder how bored she gets at all the publishing galas and dinners that she probably must attend. This outing is even darker than The Cuckoo's Calling. The missing author wrote truly bizarre scenes and left chaos in his wake. Strike's ex-fiancee, Charlotte, is engaged to be married, and he has to come to terms with that and with the tiny jibes that she keeps sending his way. I admit that, only two books into this series, I am already tired of the whole Strike/Charlotte drama. It just seems to take up so much of Strike's emotional stores and Charlotte isn't given enough of a personality for us to really care what she does, anyway. She's just like this succubus, taking time and energy and will away from the story and Strike. In these two books, I also was annoyed by Robin's relationship with her fiancee. She's an intelligent, driven, and beautiful woman, and it's hard to believe that she would waste her time on someone who did not value her or treat her well. Unfortunately, that's pretty much exactly what her fiancee is like. But through The Silkworm, we get a few hints at what drew her to him in the first place - she says very clearly that she loves him and wants to marry him, and she tells him what she wants to do with her life. And I appreciated that. I did not want to be in a story with another beautiful, intelligent woman who just doesn't have the self-esteem to leave the jerk she's with behind. The relationship I do love in this series is the friendship between Cormoran and Robin. It continues to develop here, and I look forward to seeing that continue. I remember learning in college that Rosa Parks had a long history of activism and that sitting down in the bus was a deliberately planned action and being blown away. I think that's a really important story to tell. The way it was taught to me growing up was just that she was tired one day and didn't want to get up. That sends such a completely different message! I completely agree! There was a quote from her about how she wasn't tired physically that day - she was just tired of segregation and sick of making way for white people all the time. >>I wonder how bored she gets at all the publishing galas and dinners that she probably must attend. I used to work for a nonprofit that sometimes had benefits, and I got soooooo bored at the benefits. It's not that rich people are horrible (though they sometimes are), so much as that I felt like an interloper. I always felt like someone was going to notice that I was riffraff and make me leave. It was not a pleasant feeling. I complain about not being rich sometimes, but actually I do not want to be rich and hang out with all rich people. I am not suited to it. My mother surprise-loved these books, so she's lending me The Silkworm soon. We'll see how it goes. I like-not-loved The Cuckoo's Calling. I knew How Green Was My Valley is a movie - didn't know it was a book also. Sounds like a good one.